It wasn’t quite the family bonding experience I usually look forward to. Ten days of the flu…our entire household. 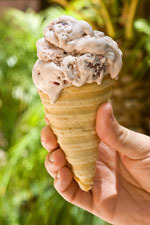 There is a very good reason they give shots for this (and, yes, we had ours) – it’s no fun at all if you get it. I can’t remember if I’d ever had the flu before this bout, but if I did I definitely didn’t have two little kids to take care of who were also harboring the flu (miraculously exhibiting 1000x more wall-bouncing energy than I could muster). We didn’t leave the house except for doctor visits, the fridge emptied and the laundry piled up. Although I can’t exactly say it was a “fun” time, at some level I did kind of enjoy being home and having my little family all together as we tried to rest up and get well. I’m so glad to get back to blogging! 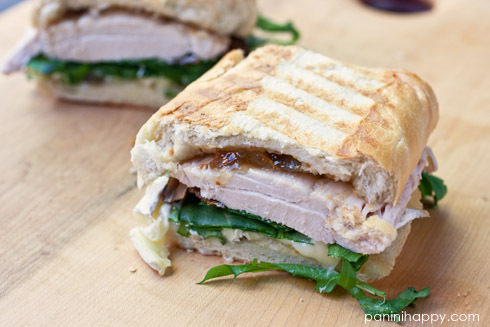 I hope you’ll enjoy these Chicken, Brie, Fig and Arugula Panini as much as my husband and I did. You may recognize many of the fixins from the Panini Party – carved rotisserie chicken, sliced Brie, sweet fig jam and a handful of fresh peppery arugula grilled on a baguette. I used to never include delicate greens like arugula in my panini, out of concern that they’d wilt, but these days I’ve come around a bit on that. I love the flavor and the color that the leaves add, so you just might start to see a lot more arugula, baby spinach and watercress on Panini Happy! For each sandwich: Slice off the dome of the baguette to create a flat grilling surface. Divide the baguette in half lengthwise to create top and bottom halves. Spread a few tablespoons of fig jam inside each baguette half. 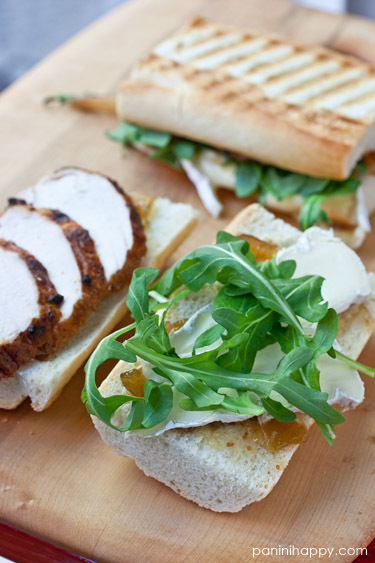 On one side, layer a few slices of Brie, a small handful of arugula and a few slices of chicken. Close the sandwich with the other baguette half. Grill the panini until the cheese is melted and bread is toasted, 3 to 5 minutes. Off to see if I have fig jam in the fridge! Love the combination of flavors here. So glad you are feeling better. That does not sound like fun. 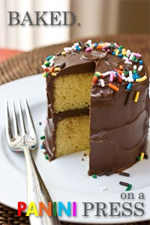 I’m thinking this salty/sweet combo is a keeper in my book! I’m sorry you’ve been so sick – no fun at all! This panini looks like a wonderful thing to come back to – Brie is one of my favorites and it works so beautifully with fig jam.